Transmedia storytelling is the technique of sharing a story across multiple platforms and formats using current digital technologies, according to Henry Jenkins in his book Convergence Culture. For the band September Mourning, they’ve got transmedia storytelling down to a science. The project originated between Emily Lazar, also known as September, and Marc Silvestri of Image Comics. After Lazar pitched the idea to Marc over Myspace, the two created the characters and storyline. “I told him I wanted to do something that was transmedia that surpassed all different forms of media,” Lazar said. Emily’s background of music was a blend of different genres and a big inspiration to help her create today’s sound of September Mourning. Between her parents love for classical and jazz and her uncle’s passion for death metal, creating this project gave her a chance to explore a variety of sounds before creating the sound of the band. “Volume II” is the latest album release and coincides with the release of the latest comic book issue, The Hand of Fate. “Wherever the comics go, the writing of the music follows,” Lazar said. While the story of the comics has the reader’s attention from start to finish, the live performances do much of the same and on a wider scale. The storyline on the pages is brought to life, bringing out the personality of the character of September and being taken on a theatrical journey through her world. A show of that caliber is sure to impress anyone, especially their fans. “Children of Fate”, both a song on the record and the name of their fans, is a simple reminder that fate or destinies can be controlled. “Anything that they want out of life, they can acquire; they can get it if they put their minds to it. It’s a very positive outspoken outcry for our fans,” Lazar said. Every aspect of this project is so brilliantly done and certainly pushes boundaries. 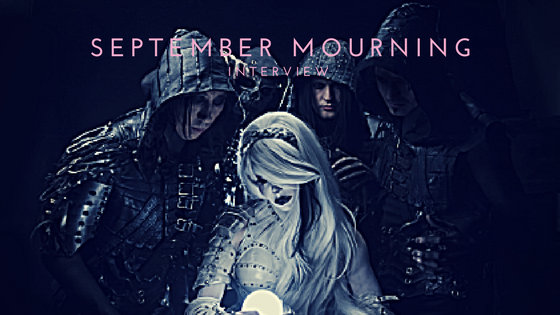 From comics to music to videos and gaming, September Mourning is sure to take over the entertainment world – one comic strip at a time.